The CS2 digital force testers from Chatillon are revolutionary systems optimized for production testing applications, including medical devices, plastics, packaging, textiles, rubber and electronics. 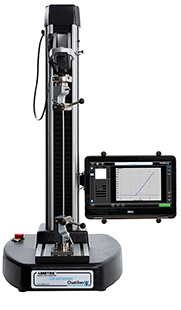 These robust force measurement machines provide their operators with an easy-to-use, intuitive and straight-forward method for tensile testing (Pull), compression testing (Push), shear testing, flexural testing or advanced multi-stage testing adherent to ISO and ASTM testing procedures. The CS2 Series feature a 2-in-1 laptop console with a user-friendly, robust and reliable 9” touch screen for use in production environments. The screen offers both graphical and tabular results along with a very intuitive user interface regardless of the operator skill level. A few touches are all it takes to set up a test, select runs and present reports. The set up parameters include limit testing (load, distance and time), break testing, cyclic and loop testing, multi-stage / user defined testing, spring rate calculation and height measurement. The CS2 Series is available in a 1 kN (225 lbf) and a 5 kN (1100 lbf) frame capacity. The CS2-225 offers a large work area with 180 mm throat depth and a 500 mm crosshead travel. This model is ideal for testing applications up to 1 kN (225 lbf). The CS2-1100 offers 150 mm throat depth and a 800 crosshead travel and is ideal for testing applications up to 5 kN /1100 lbf). Both models have a speed accuracy better than 1%. No personal computer, propriety software or knowledge of programming language is required. Find the Declaration of Conformity for the CS Series force measurement machine here. Software Version 2.5.1 11-Dec-17. Supports installation on a separate computer from the CS2 Series Touch Console. Will not run on the CS Series Touch Console (first generation). New or Enhanced Features: 1) The CS2 drivers are automatically installed during the software installation process, 2) Supervisors will be prompted before exiting the software, and 3) The archive and export screens have been re-worked. Fixed Bugs: 1) Corrected orientation for the PDF graph, 2) Allows only one instance of the program to run at a time, 3) Spring rate can now be calculated when pre-load is enabled, and 4) realigned data in the CSV export. Firmware Version 1.2 Issue 5b 01-Feb-16. Changed load filter setting to 8.